Dear Readers, this week I decided to take myself off for a small adventure, in a place that is near at hand but completely new to me. 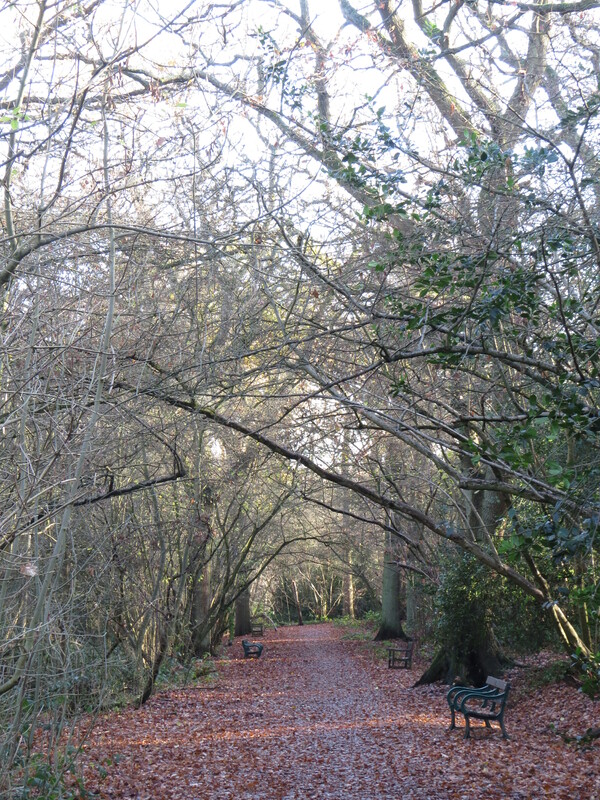 Big Wood is just around the corner from East Finchley, in Hampstead Garden Suburb. It is not actually a very Big Wood, but at 7.3 hectares it is bigger than nearby Little Wood, at 1.2 hectares. It was originally part of the Bishop of London’s estate but was leased to many different owners, who coppiced the wood for fence posts and firewood. From 1810, however, it seems that the wood was turned over to oak timber – most of the magnificent oaks date from the 19th century. 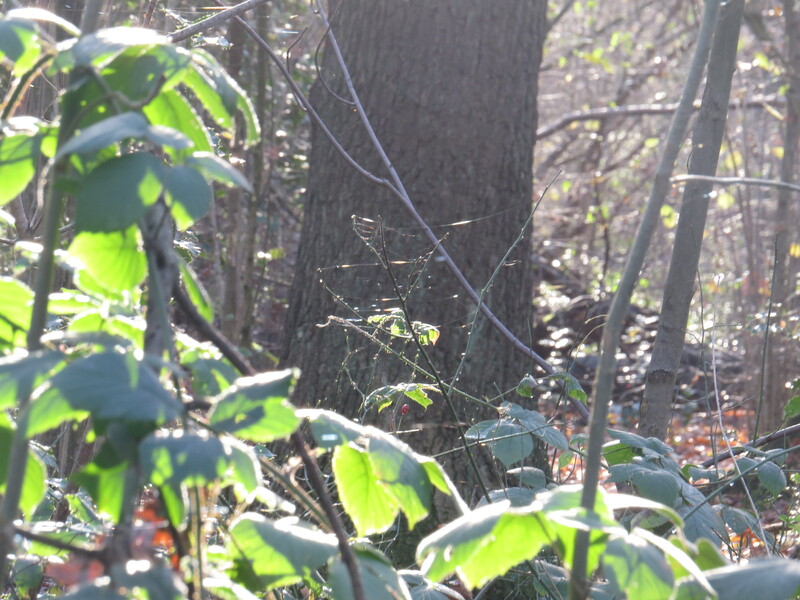 Furthermore, the understorey is largely hazel coppice, rather than the hornbeams from my local Coldfall wood. 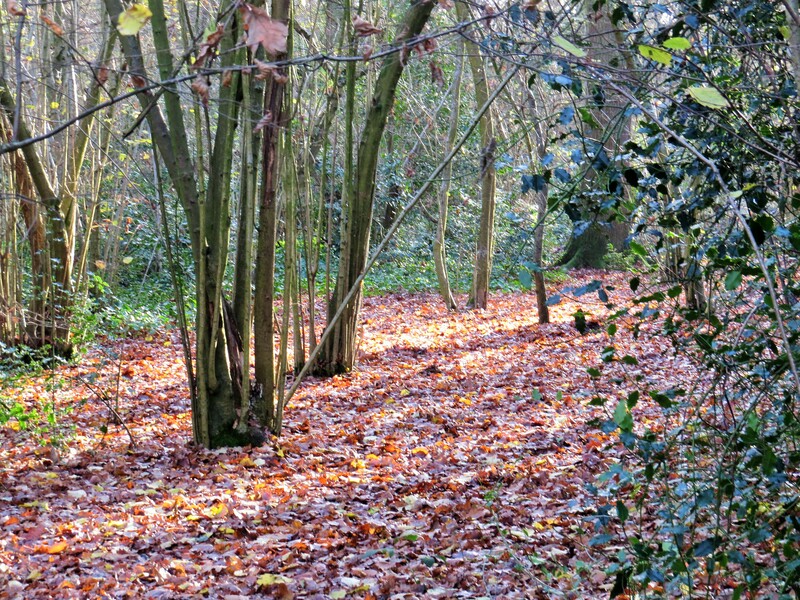 The remnants of ancient woodland in North London have been heavily managed since medieval times, and probably for far longer. It’s not all oak and hazel, however. This tiny wood holds over 80 wild service trees, who spread only from the root of the parent plant in the UK because it’s too cold for the seeds to germinate. They are therefore an indicator of the age of the wood, and also a sign that, however the wood has been managed, some parts have been left alone for centuries. 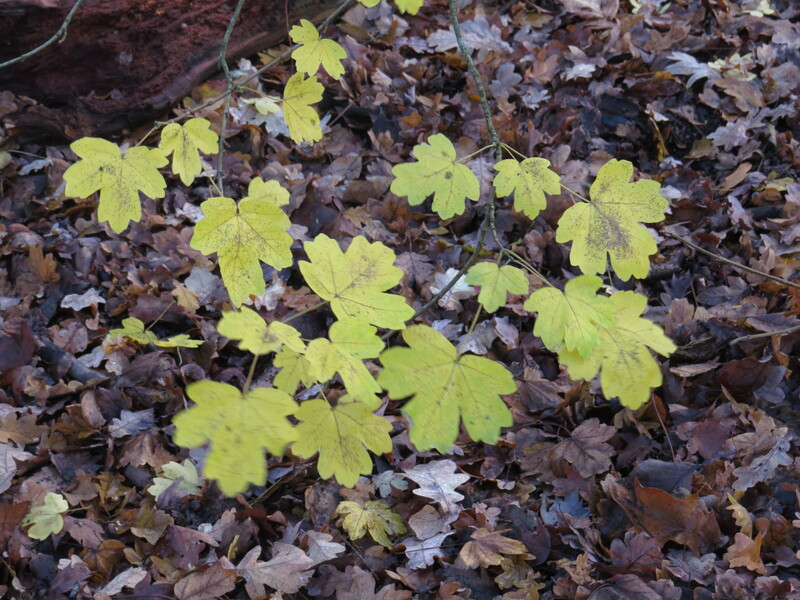 There were still a few of the golden-yellow leaves left. There are also true wild crab apple trees. 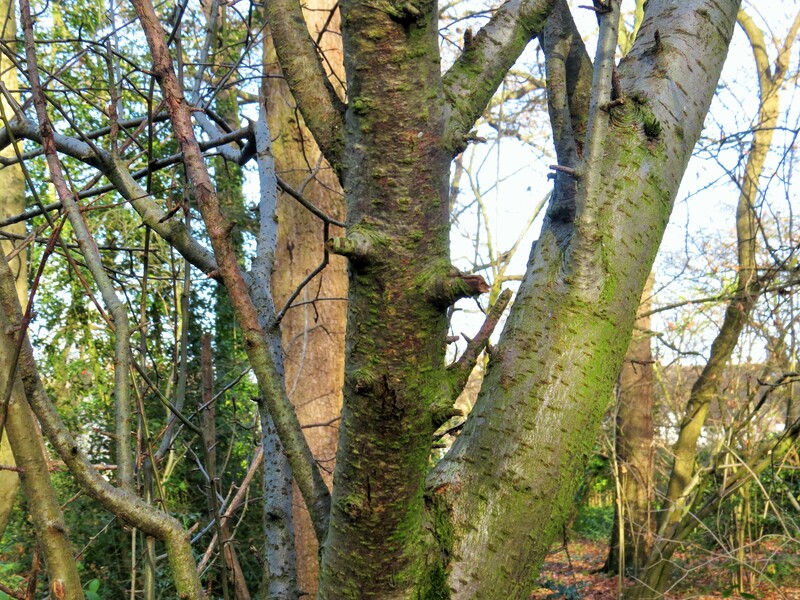 The thick spiny growth on the trunk indicates that these are not ‘wildlings’, trees which have grown up from discarded apple cores, but original trees – some are over a hundred years old. I shall have to visit again when the trees are in blossom – there are lots of wild cherries here too, some of them as tall (though not as robust) as the oaks. As I walk slowly through the wood, I hear the drumming of woodpeckers. Are the males setting up territories already? I hear one bird and then another, a little further away. There is lots of standing dead wood, perfect for nest holes, digging for grubs and percussion. Nuthatches are scurrying along the branches, excavating under the loose bark for small insects. 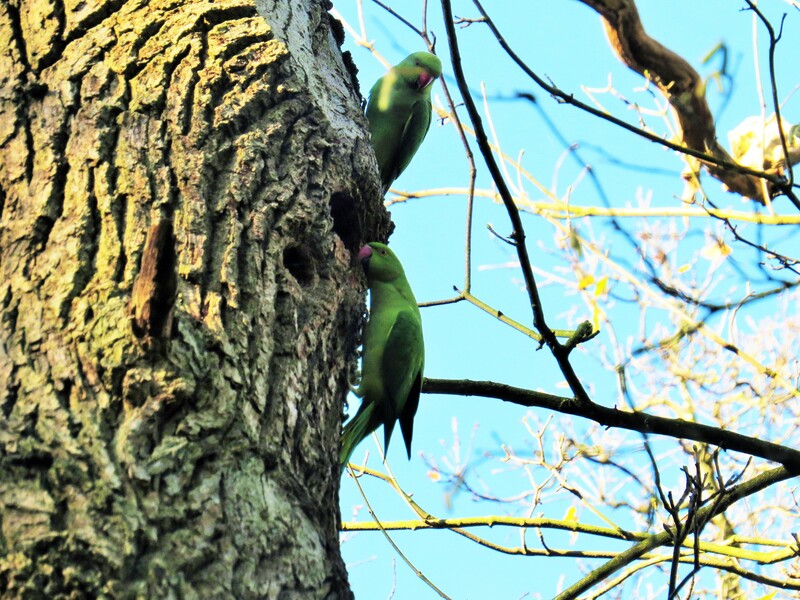 But the rowdiest of the forest inhabitants are undoubtedly the ring-necked parakeets, with their squawking and their arguing. 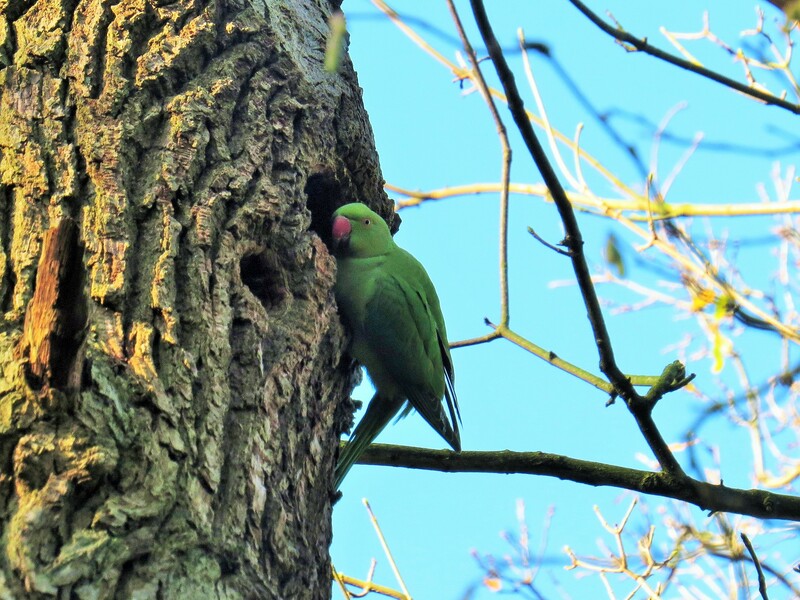 I have mentioned before that they are amongst the earliest of the hole-nesting birds, getting themselves settled well before the woodpeckers and the stock doves. A pair in the tree above me were definitely house-hunting, and weren’t above making their own alterations, digging out the hole that they’d found and showering me with bark. I often find that when I go for a walk I start out at a brisk trot and get slower and slower, eventually coming to a complete halt. And it was while I was sitting on a bench that I noticed how the sun was lighting up the spider silk in the bush opposite me. The more I looked, the more strands I saw. Onwards! 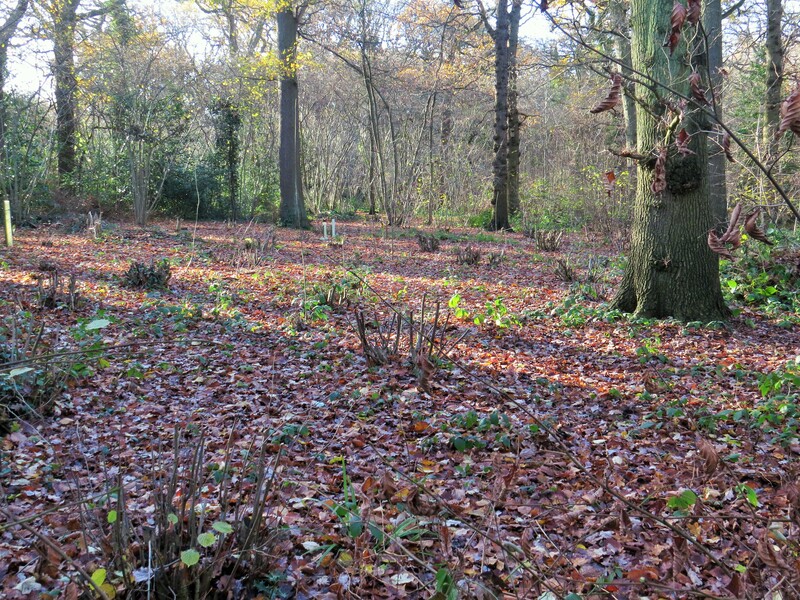 In one part of the wood, the hazel coppice has been cut right down to the ground. 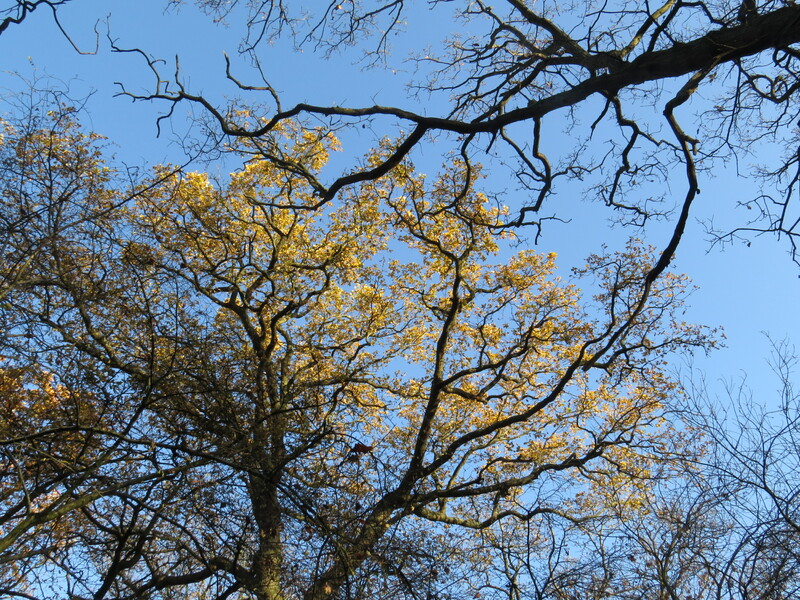 The health of a wood depends on having trees of various ages, and the young oak trees here do badly because the older trees completely screen out the light. So, the people managing the wood are transplanting failing young trees into this much brighter area to the north-east of the wood, in the hope that they will thrive there. They have also planted a variety of local woodland flowers in the hope of increasing the biodiversity. I shall have to pop back in the spring to see how it’s all doing. As usual, though, it’s often the small things that catch my eye. 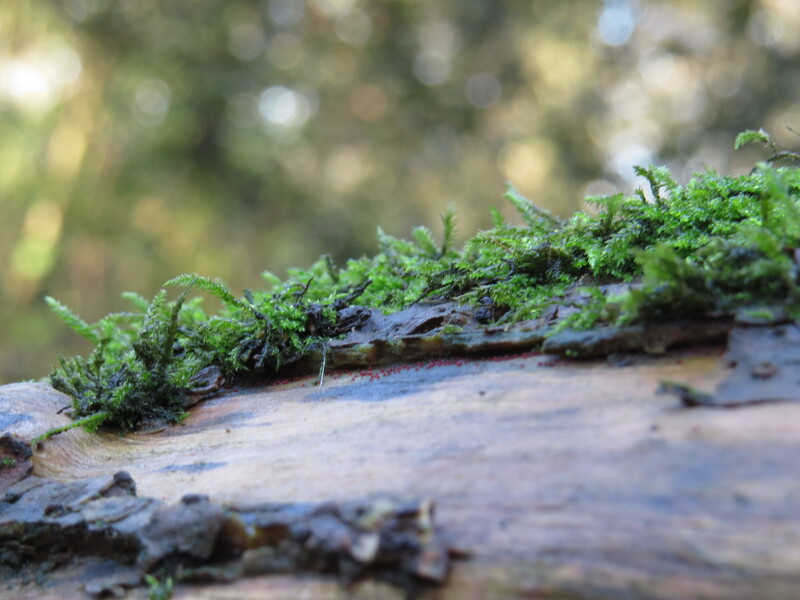 There are miniature forests of moss on some of the hazel branches. 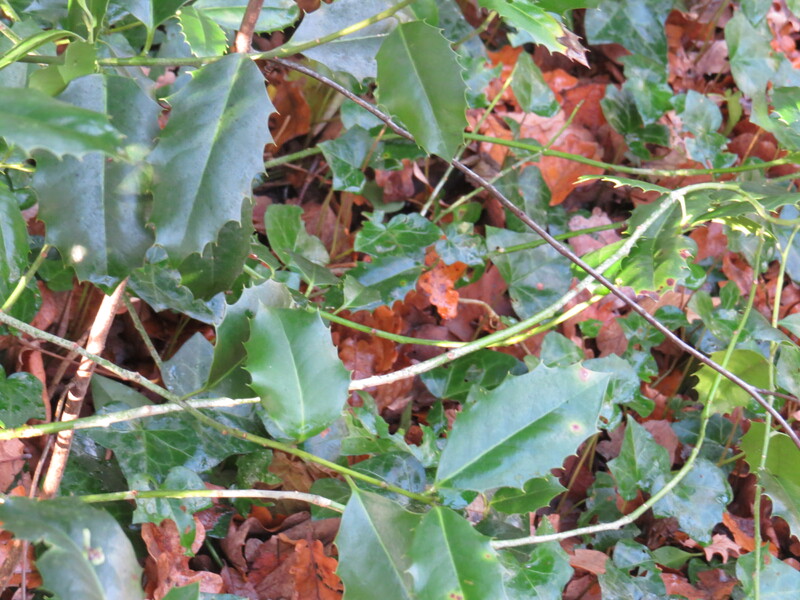 The holly and the ivy grow together, appropriately as Christmas approaches. And through it all, the dappled sunlight. Big Wood is a well-used spot, full of children and dog-walkers and runners, and yet it retains a certain wildness, even so. It has seen so many generations come and go but here it still is, getting on with the business of photosynthesising and decay. The cycle of life goes on regardless, and on some days that is a comfort. There’s nothing like standing next to an oak tree to give one a sense of perspective. 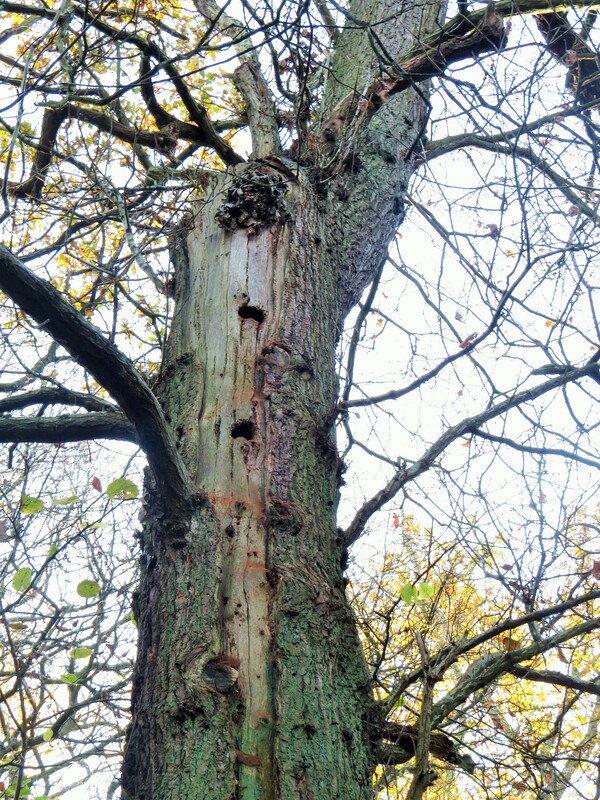 This entry was posted in Bugwoman on Location, London Birds, London Places, London Plants on December 8, 2018 by Bug Woman. Well said. A lovely post for a December morning! 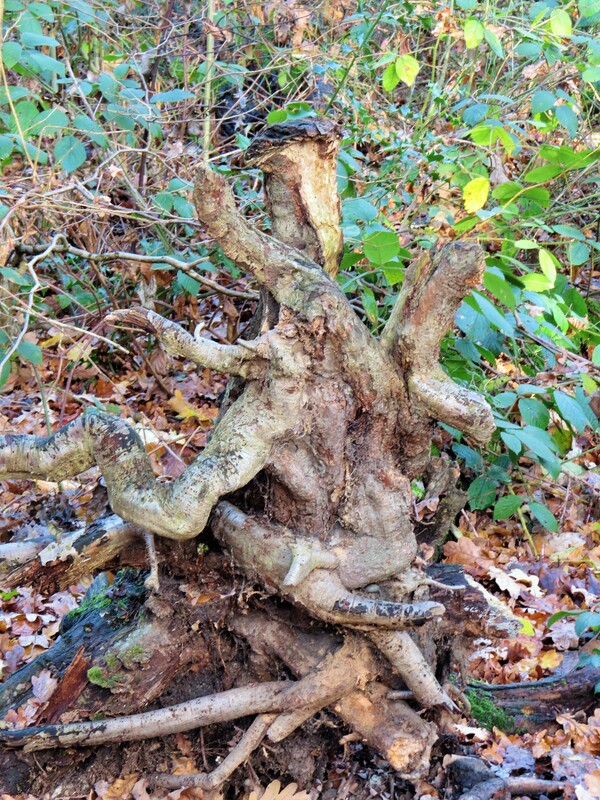 Your root(s) reminds me of an octopus. Well, each to their own. I happen to live among the tallest trees in the world, and some are thousands of years old. Yet, they have only been clear cut harvested, and now are in desperate need of management. It is not something we do here. Such a shame, Tony….I’ve seen some very big sequoias in British Columbia, but you didn’t have to walk very far into the wood to see that, behind them, the trees had been clear cut. We’ve lost most of our woods in the UK too, and what replaces them is often pine plantation, though it should be said that some companies are now planting more mixed woods. We truly don’t know what we’ve got till it’s gone…. Sequoias in British Columbia? They must have been the giant sequoias. They do not do so well here. The native coastal redwood grow like weeds, and recover very well from clear cut harvesting. The problem is that they come back with multiple trunks that need to be thinned to single trunks. Selective harvesting is actually a responsible management technique. However, tree huggers want NO harvesting. This increases the combustibility of the forest, and only necessitates harvesting from somewhere else, including virgin (unharvested) forests that need no management. 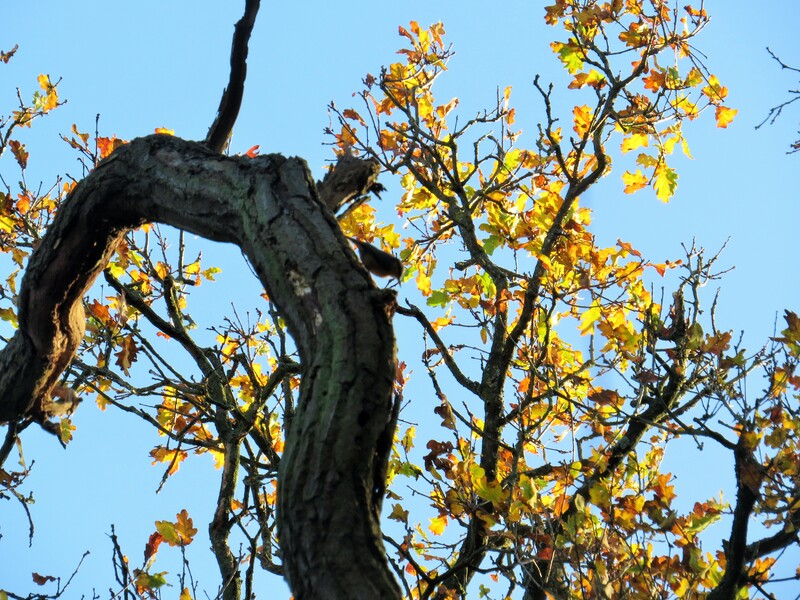 A fabulous walk Vivienne – woodpeckers are one of my favourite sounds of all. I love that drumming noise too.